While hygiene cleanings can help clear your smile of plaque and bacteria, these visits only occur every six months or so. Between visits to our Encinitas dentist, it’s up to you to take care of your smile. Learning good habits in between appointments, and guide other members of your family to do the same. We have some tips to help bolster your arsenal of top-notch dental care. While you may have the right toothbrush and floss, what also matters is the amount of time you brush your teeth for. The American Dental Association proposes the 2 By 2 rule: brushing twice a day for at least two minutes each time. Teach your children to keep the two minute time by using a timer or a fun song that lasts the two minutes. Another important skill to master is how to correctly brush your teeth. Simply scrubbing away can actually do more harm than good! Make sure your toothbrush is at a 45 degree angle to the gums. Brush in a gentle circular motion, and make sure that your gums feel the bristles too. Brush all the surfaces and sides of each tooth. Don’t forget your tongue! If your toothbrush has a tongue scrubber on the back, use it. If not, then invest in a tongue scrubber to keep pesky bacteria away. For flossing, be sure to use 12 to 16 inches of floss. After placing the floss between each tooth, use a “C” shape to guide food particles up and out of the pockets. Do not jam the floss down into your gums. 1 in 4 adults admit that they don’t brush their teeth twice a day. Brushing only once a day increases your chances of tooth decay by 33%. Although approximately 85% of the population have medical insurance, only 57% have dental coverage. Over 164 million work hours are lost each year because of dental problems. Over 51 million school hours are missed for the same reason. Fluoride is essential to combating tooth decay, and can easily be found in safe amounts in drinking water. In America, tooth decay decreased by 30 – 50% after fluoridated water was introduced. In 2014, 83% of children aged 2 to 17 visited the dentist that year. Unfortunately, only 62% of adults visited the dentist in that same year. Poor oral care has been linked to heart disease, diabetes and other health problems. Baby Bottle Tooth Decay: This occurs when your child frequently drinks formula, milk or fruit juices. If you neglect to clean their gums or teeth afterwards, they can experience tooth decay in the same form. Use a damp cloth to gently wipe your baby’s gums after a feeding. Teething: As your baby’s teeth start to erupt, this can be an uncomfortable time for them. Gently rub their gums with a clean finger to soothe tenderness, or give them a cold teething ring to chew on. First Teeth and Pacifiers: Sucking on a pacifier is completely normal at this stage, but keep in mind that frequent, long-term sucking can lead to potential problems. Their teeth may erupt misaligned or crooked, and could influence their permanent teeth placement after they start to lose their baby teeth. Brushing and Flossing: For a healthy smile in adulthood, it’s important to start instilling good dental habits when your child is young. Teach them the 2 by 2 rule and how to floss correctly. Show them what could happen to their teeth if they don’t care of them. Good Nutrition: While sugary treats are every child’s favorite, this is also the time to teach good dietary choices. Sugar is sweet, but must be cleaned off with brushing and flossing. Some smile-friendly food choices include crunchy vegetables, leafy greens and fish. Routine Dental Visits: Start taking your child to see a pediatric dentist after their first birthday. A pediatric dentist is specially trained to help developing children keep healthy smiles. As you bring your child to more and more routine visits, they will become more comfortable with the dentist. Orthodontics: As your child gets closer to their teen years, we’ll start looking into whether your child is showing signs of misalignments or crookedness. Misaligned teeth can lead to a whole host of problems such as exposure to oral diseases or jaw joint pain. By correcting these problems while they’re young, you can ensure them a lifetime of healthy smiles. If your child is showing signs of needing treatment, Dr. Sherman can provide parents with referrals to trusted local orthodontists. Wisdom Teeth: Once wisdom teeth start to emerge, have them examined and evaluated. They may need to be removed for your child’s safety, so that they won’t crowd the teeth. Be Mindful of Alcohol and Tobacco: Both alcohol and tobacco contain elements that are harmful to your oral health. They dry out the mouth of saliva and expose soft tissues to harmful chemicals. Alcoholic drinks can also contain a lot of sugar, which feeds cavity-causing bacteria. Oral Cancer Screenings: This stage in life is when we’ll start screening for oral cancer as well. Oral cancer can manifest in different ways, but most commonly as lumps under the skin or as red and white lesions. During routine hygiene visits, we’ll check the area around your neck and jaw for any warning signs. Cosmetic and Restorative Treatments Available: Adults can also qualify for specialized treatments. At Diane W. Sherman, DMD, we offer a range of cosmetic procedures can freshen up and whiten your smile. Restorative treatments can restore functionality to damaged teeth. These treatments combined can give you a whole smile makeover. Dental Devices Available: If you have lost one or more teeth, there are options available to replace missing teeth. In addition to bridges and dentures, our Encinitas dentist offers dental implants and implant supported restorations. Dr. Diane W. Sherman, we have beautiful fixed bridges and custom crowns to help restore your smile fully. Invest in Easier Oral Care: If manual brushing is becoming more tiresome, trade in for an electric toothbrush. Sensitive teeth can be soothed with sensitivity toothpaste as well. Osteoporosis: Patients afflicted with osteoporosis may experience loose teeth as their jawbones deteriorate. Stay on top of dental care needs and invest in dental devices to maintain a strong smile. Medications and Hormonal Changes: Certain medications and hormonal changes in your body can result in dry mouth conditions and bad breath. This is normal, and can be fixed with an upkeep in dental care. We understand that busy patients may not know what’s best for them and their family at home. That’s why we’re here to help! Dr. Diane W. Sherman and our team want to help you maintain the best smile possible. To do that, we recommend regular dental hygiene visits and the right tools at home. 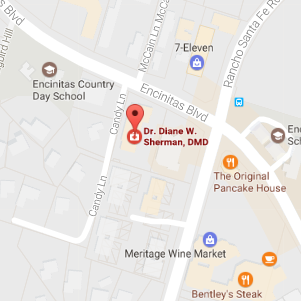 Contact us today with any questions you have or to schedule a consultation with Dr. Sherman in Encinitas.